Today I was at Cliftoria for the plumbers. But unexpectedly the electricians arrived too. The plumbers were waiting when I arrived a few minutes late at 8:06am. They got to work by removing the mid-air pipes and capping them all back into the walls. All that is except for one hot water pipe and the drain pipe in the converted fireplace. Who converts a fireplace into a kitchen sink? They were cut back but not into the walls as they go through a wall and under the bath in the western ground floor bathroom. I decided to leave them as they are for another day as the current plans do not call for that fireplace to be working for quite some time. We can deal with them when that time arrives. Especially as I watched the work involved in the other bathroom. After the pipes were cut back they set to work on dealing with the leaky pipe in the eastern ground floor bathroom. 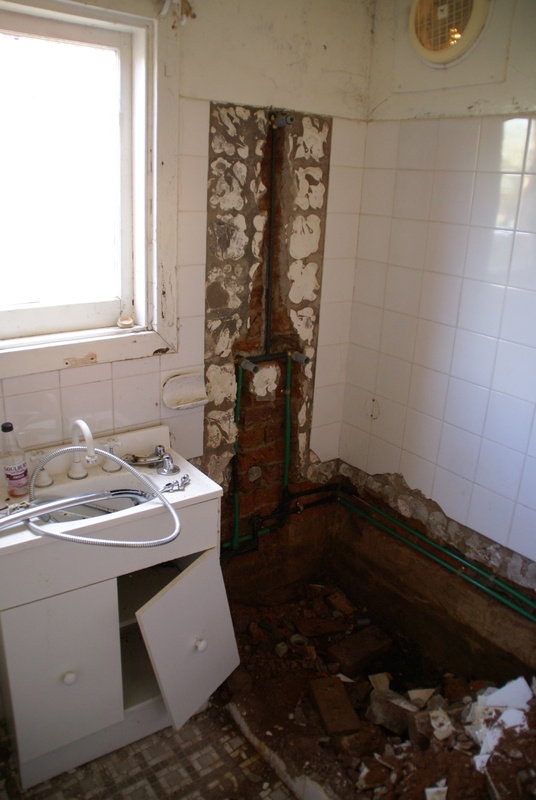 The small jack hammer was unpacked and used to remove the tiles from the wall around the taps. Then it was wielded to remove the cast iron bath from the room. Some of the pipes were iron and needed to be replaced after spending 88 years in the walls. They have all been replaced with copper and should last quite some time. We still have to install a shower and a new set of tiles. Victorian style tiles is the plan. The bricks are very damp from the water leak over a long time. It is possible to see some plant roots growing through the wall. I’m glad we are going into summer so the walls have a good chance at drying out properly before we cover them with tiles again. The plumbers didn’t leave until almost 5pm but their work is done. We have water from now on. The electricians also turned up today in a surprise move as we were waiting for them to inform us that they had the new meter and when they could scheduled us in. 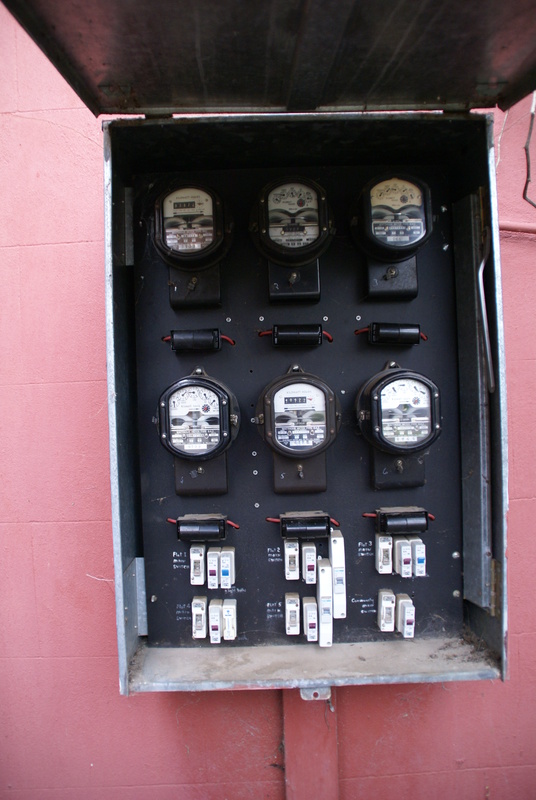 The switchboard now looks very bare as the 6 old electric meters have all gone and a smaller digital meter has been installed. 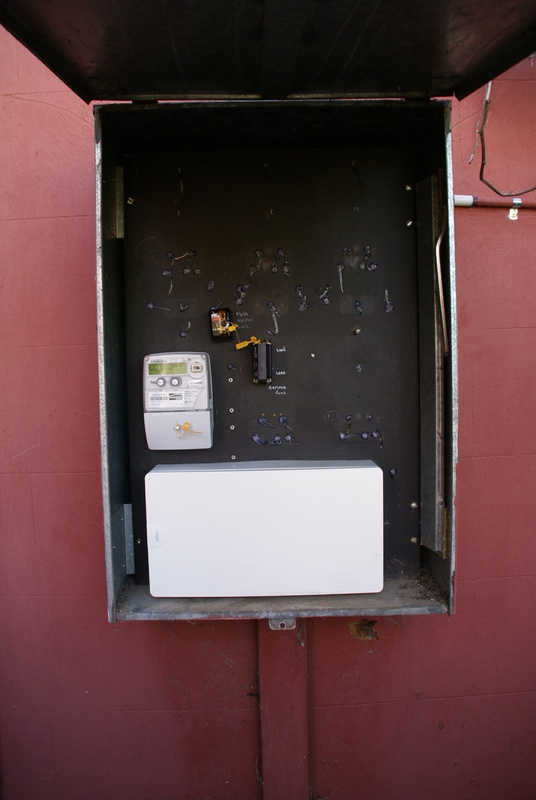 The switches have all been replaced and are in a plastic box with room to double their numbers if we need to. The electricity is now sorted and on. The last major service to be sorted is the gas, which we hope will happen later this week. 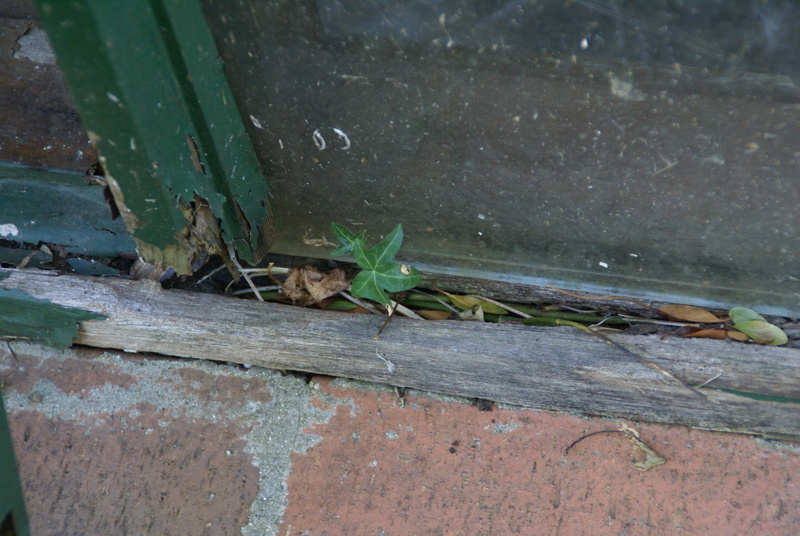 This is how the ivy has damaged the stable windows by growing into the frames and keeping them damp which has caused some rotting of the frame. I’m not sure at this point what to do with them. It is repairable. Sharen has suggested a set of French doors on this wall would be great to allow people to exit the stable straight into the garden. I think it would be a good idea too. It was a very productive day all around.